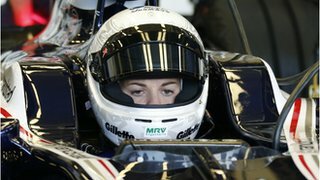 Susie Wolff will have her first full Formula 1 test at the wheel of a Williams in this week’s ‘young-driver’ test at Silverstone. The Scot will drive on Friday, with race driver Pastor Maldonado in action on Thursday, while Spaniard Daniel Juncadella is set to test on Wednesday. Teams are being allowed to run race drivers for one day at the test on 17-19 July to evaluate new tyres. Wolff, 30, is currently the development driver for Williams. She raced in the DTM German touring car championship for seven years before quitting the series to concentrate on her work with the British outfit. It is not the first time Wolff has driven an F1 car – she had a familiarisation test with Williams last October and was the first to drive the team’s 2013 car this year at an aerodynamic test in February, and described the Silverstone test as “a fantastic opportunity”. Wolff added: “It’s going to be a big challenge but the most important thing is to do a solid and consistent job and to give good feedback to the team to be able to prove I am at the level to compete on a day such as this. “Most of my work is based in the simulator which is why this day is so important for me. “It will give me a better understanding of what the car is like on track and how that correlates to the simulator which will also help further develop the work I can do there. The last woman to enter the F1 world championship was Italian Giovanna Amati, who failed to qualify for three races with Brabham in 1992 before being dropped. The last woman to race an F1 car was Italian Lella Lombardi in 1976. Only two other teams have so far confirmed their line-ups. Lotus will use Kimi Raikkonen on the final day of the test with Frenchman Nicolas Prost – the son of four-time world champion Alain Prost – driving on Wednesday and reserve driver Davide Valsecchi on Thursday. McLaren and Red Bull have chosen not to use their race drivers. Reserve driver Gary Paffett (Friday) and young drivers Kevin Magnussen and Oliver Turvey will test the McLaren. Portuguese Antonio Felix Da Costa, a contender for a Toro Rosso seat in 2014, will take the first two days for Red Bull, with Spain’s Carlos Sainz coming in on Friday. Sauber will use Nico Hulkenberg on Thursday, and split the rest of its programme between reserve driver Robin Frijns and Japanese former Formula 3 driver Kimiya Sato. The ‘young-driver’ test is an attempt to allow teams to try out drivers who have not yet raced in F1 – the rules dictate that those taking part must have competed in no more than two grands prix. Pirelli has decided to revert to the construction used in 2012,which has a stronger shoulder, from the Hungarian Grand Prix, but combined with the softer rubber compounds used so far in 2013.